March 21 was a joyful festive day of Holi for people all over the country. People everywhere were playing with colours and splashing water. But people in Ahmedabad chose to celebrate it differently, more like the Spanish people. 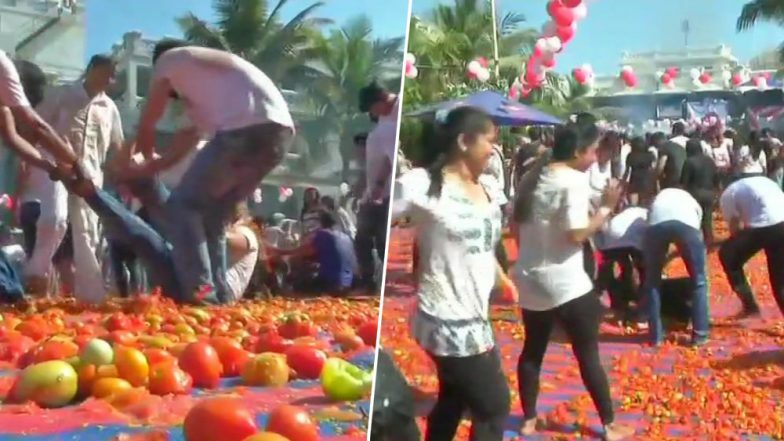 Bring in the 'La Tomatina' Holi, people in Ahmedabad played with tomatoes. So instead of using coloured powders, they felt tomatoes on each other and smashed them all over the roads. But while it is a proper annual tradition in Spain, people here were not impressed by the replication. Twitterati was angry with so much wastage of tomatoes. Love Celebrating Holi? Here are Some Fun Festivals From Around the World That Believe in Getting Messy. People in Ahmedabad chose to go the Spain way of celebration which we have seen in the Bollywood film Zindagi Na Milegi Dobara. Pictures from the place showed a lot of tomatoes lying on roads and people stomping and playing in them. Twitterati wasn't impressed and most of them questioned why were people wasting so much, especially in times when farmers are suffering due to the drop in rates. While some people joked about it, others weren't pleased. Check how some of the people reacted. What have Celebrations come to? Its criminal to destroy the farmers months of hard work and sweat for ones pleasure. What have we come to. This is certainly not right as it's not our culture or custom. It's not tomatino festival, Its Holi! It could have fed many a poor family. Wrong move , shameful. Why is the state of Gujrat aping Spain??? And why wasting like this? Instead should distribute in poor atleast. Many people expressed the same sentiments. While some made cultural references, others called it plain wastage of food. What do you think? Was it appropriate to bring in a cultural twist to the festival of colours?